A special limited time offer. 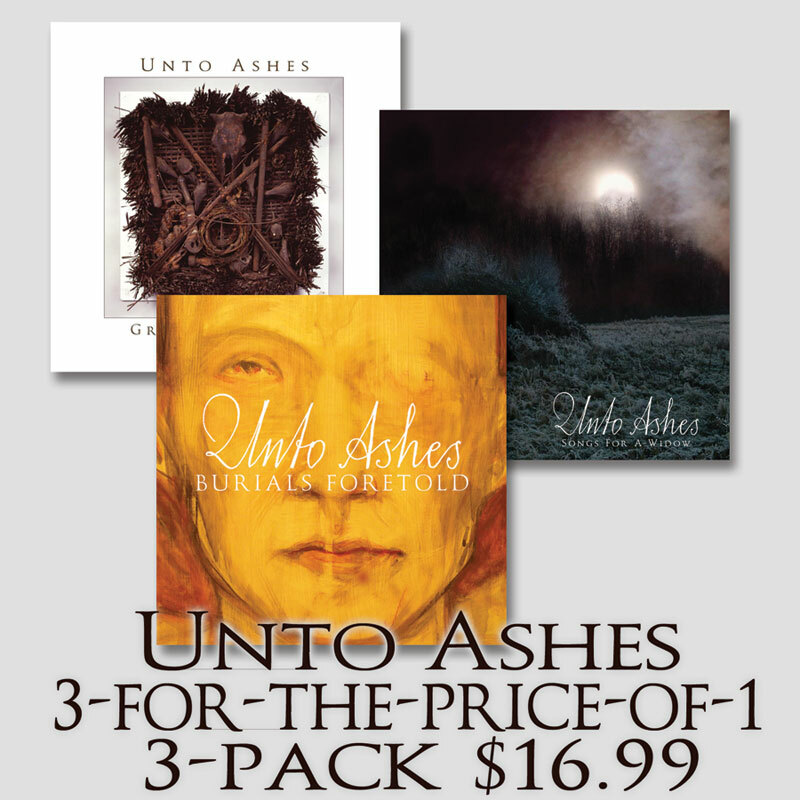 Three Unto Ashes CDs for the price of 1. Read full descriptions of each album here: Grave Blessings (4th album / 2005), Burials Foretold (5th album / 2006) & Burials Foretold (7th album / 2012). Songs For A Widow, the fifth full-length Unto Ashes album, is an intense and magnificent album of apocalyptic folk, medieval doom, forest metal, heavenly voices, experimental gloomscapes, military funeral choirs, and synthetic darkwave. This New York-based trio is absolutely alone in what they do. Who else besides Unto Ashes could (or would) transform Covenant’s synth-pop anthem “One World One Sky” into a mournful funeral dirge? Among the vanguard of apocalyptic folk & neo-Medieval music, Unto Ashes’ Burials Foretold will be classed as one of the preeminent statements in this unique genre. On their seventh full-length album, band members Michael Laird, Natalia Lincoln and Ericah Hagle reunite their exceptional voices & visions, providing unsurpassed vocal harmonies. The album was performed on a broad array of Medieval & Renaissance instruments interwoven by acoustic guitar & piano. It draws upon wildly diverse influences: Medieval music, long-forgotten poets, 70s progressive rock, heavy metal, synth-pop, Arabic music and modern classical composers. A breathtaking listening experience that is at once mystical, melancholic and quite simply magnificent.